Tyson’s life outside the ring has been equally memorable and equally violent, and he has spared few details in his new autobiography Undisputed Truth. Tyson’s mother was an alcoholic who shuttled him from home to home in one of Brooklyn’s bleakest neighborhoods, Brownsville. He thought himself lucky if the roof over his head had heat and hot water. By age 7, Tyson had stopped attending classes, slipping into school only for the free meals. A savvy pickpocket by age 9, he was on the fast track to becoming a career thief, breaking into neighborhood apartments and walking out with cash, electronics and guns. By the time he was 12, he was arrested 38 times and, just as disturbing, he was illiterate. Being a neighborhood thief didn’t protect Tyson from being bullied mercilessly by older kids. He was small for his age, spoke with a lisp and was an easy target — at least on the surface. Sent to reformatory school at age 13, Tyson already looked like he does today — all muscles and a discomfiting laser-like focus. His speed and power as a boxer caught the attention of legendary trainer Cus D’Amato. Even though D’Amato knew he had a future heavyweight champ in his corner, he also knew that the neglect and abuse Tyson suffered as a boy could one day destroy him. 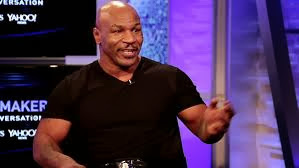 Tyson himself might say D’Amato was right when Tyson blew through the $400 million fortune he earned as the undisputed heavyweight champion of the world. Perhaps most costly of all was Tyson’s weakness for women. Regarding Tyson’s first wife, Robin Givens, Tyson today alleges that Givens said she was pregnant only to get Tyson to marry her. “She was never pregnant by me,” Tyson claims. Scarier for Tyson was the free world and the stresses of life he never learned to cope with. Though his post-incarceration comeback was successful — he won the WBA and WBC heavyweight titles in 1996 — the demons D’Amato warned about would come back to haunt Tyson in the form of alcoholism and depression. It was well known that Tyson was prescribed anti-psychotics Thorazine and lithium to control his wild behavior outside the ring. “I don’t take anything now,” Tyson says. “My wife got me off that stuff … I was 380 pounds and I had the zombie swagger. Still, you probably won’t find Tyson resting at home with a quiet book. His one-man show found its way to Broadway last year and, like any engaging celebrity, he can still be found partying. So what will Mike Tyson put on his tombstone when that day comes?